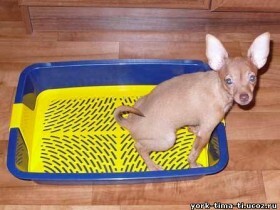 1 How to teach your puppy to the tray? 2 Where to put the tray? 3 How to teach your puppy to the outside toilet? We took the puppy home, I have to teach him to go to the toilet where it is necessary, but not, where he wants. Sometimes it is very difficult to do. In fact, dog - being very clever and quick-witted, so, if you follow the recommendations, how to train a puppy to the toilet, all will. How to teach your puppy to the tray? Many purebred dogs are very susceptible to diseases, so, until the puppy is not vaccinated, better for him to stay at home. And no matter how I dreamed, so he went to the toilet in the open air, will have to wait about four months. Of course, nobody likes to see new permanent puddle on the floor, which makes dog. The faster teach him not to spoil, the calmer nerves will. To accustom the puppy to the toilet at home, you must purchase a regular tray, filler is not necessary to buy, it is not useful. After all, the dog, This is not a cat, nothing digs. I made a deal and went. To not stand the smell, you can buy a special tool for cleaning the trays. And where you want. Pre podsteliv newspaper, put the tray into the desired location. Now we have to show this place the puppy. Puppies need to use the toilet after, he eats and sleeps. After waiting for the right moment, refer pet tray. Posydev, waited, until the baby will make their case, and, eventually, without waiting, let him play. But, here mishap, puppy makes a puddle on the floor. You can not blame him for it, otherwise he will be afraid and, even worse, have their own feces. You just need to take a piece of cloth, drop it in a puddle, which he has done little dog, and give him a sniff. AND, like this, with cloth in front of his nose, send a dog into the tray. Cloth also put to the same. So the dog make it clear, where is the toilet. And such actions, how is game, food, tray, executed until, until the puppy has not understood, what he should do. it happens, the dog still goes to that place, he likes. Will have to obey and move the tray to. And then imperceptibly slowly move capacity back, in its place. If you do it slowly, kid does not notice anything. Here so gradually accustom your pet to the tray. And when the puppy is done correctly, thank him treat, He will appreciate it. How to teach your puppy to the outside toilet? After visiting the vet, for the purpose of vaccination, it is safe to let the dog out into the fresh air. Also, it's time to teach your puppy, like going to the toilet on the street. To walk it better in a designated place to walk. There, usually, many shrubs and herbs. 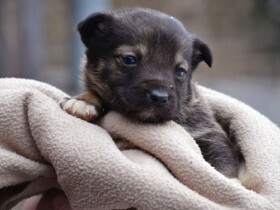 so here, having come to a place, will give your puppy. let run about, accustom. Let him feel space, where there are no restrictions. Later take the puppy to dog pile, so he sniffed. Ideally, dog must understand the idea of. But, sometimes vice versa. The puppy may experience some fear. We must help him get comfortable. Some take the tray out for a walk, The baby was easier to understand. Dogs - intelligent creatures, a little patience and everything will be done, how to. That's all. 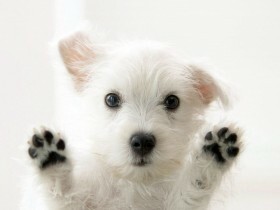 The recommendations of, how to train a puppy to the toilet, We should help in the upbringing of a pet.